When we were discussing potential entries for Regional Recipes, I don't know why we didn't think of this sandwich before last week. It just totally escaped our minds. And to think that the muffuletta would be a more appropriate entry, given that was really an American invention, invented by a Sicilian immigrant in New Orleans. If we hadn't looked through the America's Test Kitchen Family Cookbook that was not put back in its proper place on the shelf (it was instead left on the table), we would have missed an opportunity to make this muffuletta sandwich. 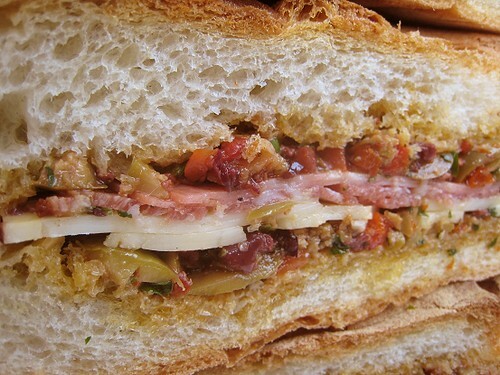 I first heard of muffuletta in 2002, while I was doing some research for a trip to New Orleans. Of course, being the tourist that I was, when the guidebook said that Central Grocery created the original muffuletta, then by golly, I went there to have one. 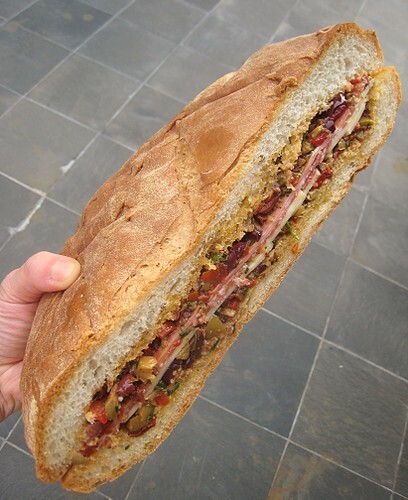 A muffuletta is a huge sandwich made with round muffuletta bread, stuffed with salami, mortadella, capicola, provolone and emmenthal cheeses, and an "olive salad" that ties the whole thing together. I remember CSC and I, all wide-eyed and not into sandwiches nor olives, taking a bite out of the muffuletta and loving it instantly. About a year ago, while flipping though our then newly-acquired America's Test Kitchen Family Cookbook, I saw a muffuletta recipe! CSC and I were so excited and knew we had to try it. That first time I made muffuletta, JS, for some reason, insisted that HALF the amount of olive salad was enough for the sandwich. Why she would insist on such a thing is beyond me. Of course, half the amount was not enough! I had to quickly make more. Now, we know better. No skimping on the olive salad allowed. This olive salad tries my patience. Not because it's difficult to make, though all that pitting is certainly tedious gruntwork, but because one has to wait until the next day before it's ready. First, there's all that pitting. The recipe called for both green and black olives. We used kalamata, queens and Calabrese (according to the package) olives. Then it's a matter of mixing together the pitted green and black olives with roasted bell peppers, sun-dried tomatoes, garlic, parsley, dried oregano, lemon juice and olive oil. 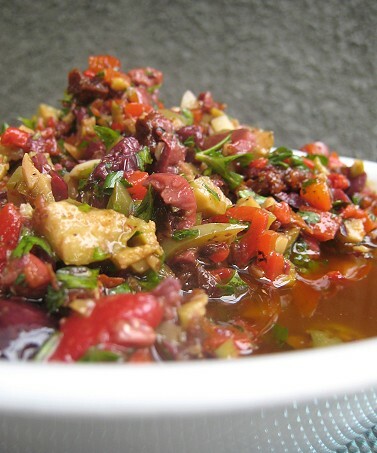 One has to wait until the next day, and finally, the olive salad is ready to use. I could bathe in this olive salad goodness! The recipe only called for mortadella and salami, as far as the meats were concerned. 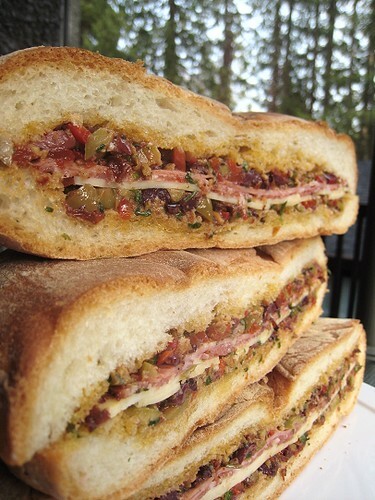 I completely forgot about the capicola until reading the Wikipedia description of muffuletta. We will have to include that in the future. The bread, meats and cheeses. First, I drained the olive salad and reserved its liquid. Each half of the bread -- we used a round Italian loaf -- had its interior crumb removed. 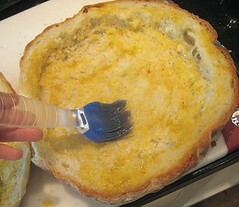 The reserved liquid was brushed onto each half of the bread. Some olive salad was spread on the bottom. 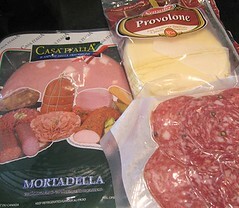 Then, next came the layers of provolone, genoa salami, and mortadella. The whole thing was finished with another layer of the olive salad. Each muffuletta was wrapped in plastic wrap and weighed down. They had to hang out like that for at least 30 minutes. You'd better believe I made two of these bad boys! 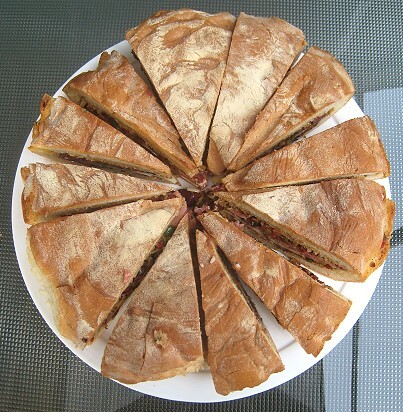 The first time we made muffuletta, I felt there was just too much meat and cheese involved. TS simply followed the recipe amount indicated for the meat and cheeses, forgetting that we are not big deli meat and cheese eaters. The amount of meat and cheese was too much for the olive salad and the bread. This time, I felt the amount of meat and cheese was just right, striking a good balance between protein, vegetable, and bread. The muffuletta was delicious: I love, love the tangy, briny olive salad and I kept wishing there was more of the olive salad. Not having tried the muffuletta in New Orleans, I have no idea what bread it was made with. TS keeps saying that the bread was "not the same, not the same". Maybe the bread we had was a tad dry, but that could be a function of when the bread was made and not the kind of bread. The muffuletta was fantastic, of course. But, the bread! [sigh] I don't know if we can find the same bread here. Perhaps next time we'll use the wonderful gigantormous 15" foccacia from the same bakery (Calabria Bakery), or the more modest 7" size. Ooh, I'm imagining all the drool-inducing deliciousness of the filling, especially the olive salad, with the fragrant herby aroma of their foccacia. Yes, I will use their foccacia. Would this go well with our Canadian Onion Soup? 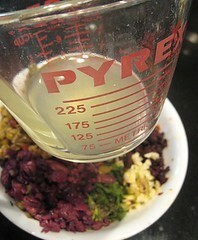 Mix, cover and refrigerate (8 to 24 hours). 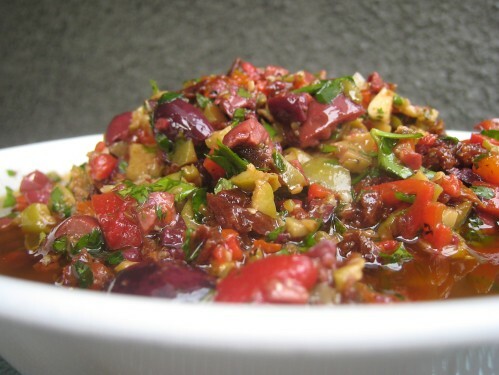 Drain olive salad. Reserve the drained oil. 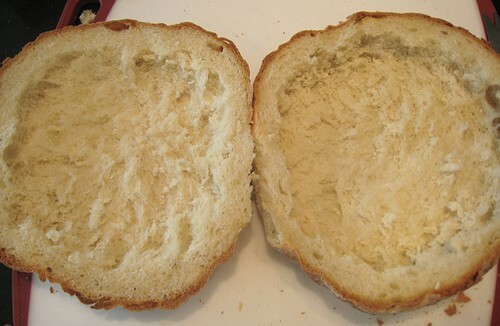 Cut bread horizontally and remove interior crumb (until bread walls measure 1/2 inch). 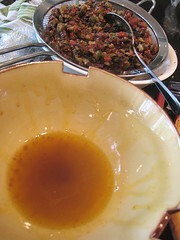 Brush top and bottom of bread with reserved oil from olive salad. Spread half of olive salad on the bottom. Layer the sliced meats and cheese. Top with remaining olive salad. Cover with bread top. Wrap in plastic wrap. 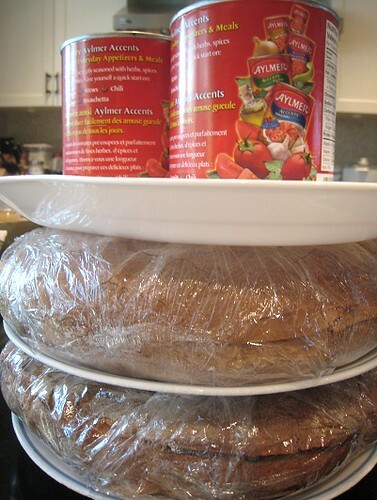 Place wrapped muffuletta between two plates and weigh down with a couple of heavy cans. Refrigerate for at least 30 minutes. Unwrap, cut into wedges and serve. All I can say is Freakin' Awesome! Umm, now I want to go on a picnic..even in rainy Vancouver! These sandwiches are a little work but great for a party or did i say picnic? Your bread choice was perfect and you did a great job. I carried a jar of the olive salad home from the Central Grocery when I visited and loved every spoonful. I've got to make me a batch! That is one incredible sandwich you got there. Great step by step pictures too. I have never made one of these but have always wanted to try. I've been really craving a trip back to New Orleans, I used to go every year, & that sandwich is not helping me get over it! That is one amazing looking sandwich! I've heard of muffuletta before, but as a fleeting reference... I didn't even know it was food! That looks awesome! Must-have! I now have a hankering to go to NOLA! You had me all drooly-like. I usually don't like sandwiches - although they're supposed to be convenient, it takes me twice as long to eat it because I can't help eating it piece by piece..first the veggies, then the meat, save the cheese, throw out half the bread..... but muffuletta? GOD, IT'S MY FAVORITE SANDWICH OF ALL TIME. My Mom used to make it for us before we'd go on family picnics. SO. GOOD. Is it wrong that I want to eat the whole thing? Great job! That looks so good. I wish I could eat it right now. Awesome to see a fellow Vancouverite's blog! Your pictures look delicious. This post esp. made my jaw drop! Been dying to try one of these but couldn't find any sources around here. Looks like a frisbee disc of a sandwich! I don't even remember seeing those olive salad jars for sale! Too bad. Of course, it was sooo long ago now. You'll probably whip one up in no time! It's great to make ahead and very portable. 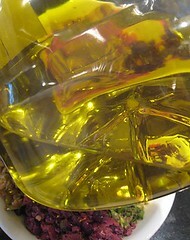 But yes, that olive mixture is dreamy... And we're going to make it for other applications; definitely. Just perfect - that is one of my all time favorite New Orleans treats! 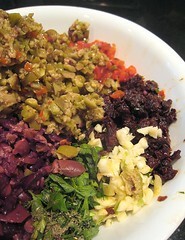 Great job on the olive salad--freshness is everything--and dont forget to leave it chunky like Central's. To address your comments on bread: it is just as critical as everything else--like a foundation. Very soft with sesame seeds on top, and never hollow-out the loaf. I like to buy a "muff" from Centrals, and let it sit in the fridge all day or overnight. Everything gets cozy and it allows the olive salad juice to permeate the bread. Great post! I have fond memories of eating muffulettas in New Orleans! Thanks for the tip! But yeah, it's so frustrating because I can't find the correct bread! 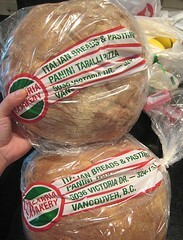 =( I have a picture of it from my trip a long time ago, but I haven't seen any bread like it here. That's definitely a variation we should try: "grilled veg muffuletta"! I have a friend who originates from New Orleans, he told me that the Cardero Bottega Muffuletta is a cross between his mother's version and the Central Grocery version. They also make a vegetarian muffuletta. We must go check it out one of these days!